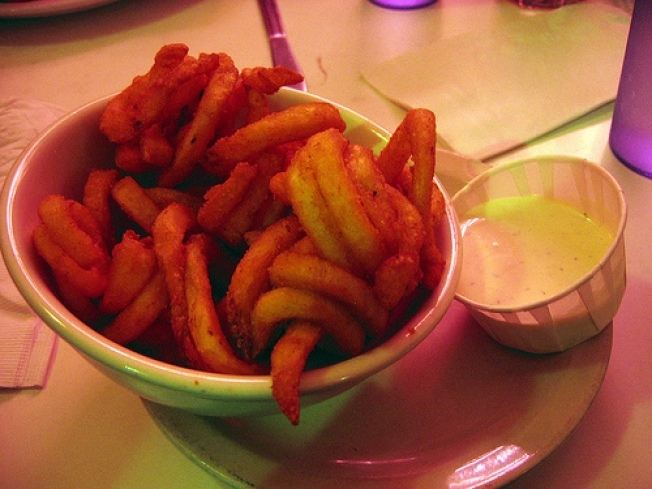 Curly fries with ranch dressing at Sparky's are a requisite post-drinking snack. I should preface this review by saying that I haven’t actually eaten at Sparky’s more than once in the past four years. However, I used to go there on a pretty regular basis during my college days. Located in the heart of San Francisco’s Castro district, Sparky’s was and still is the perfect place to end a late night of debauchery. It’s not most revelatory food and the menu is pretty standard, but it’s the kind of place that comes alive at two in the morning, when all you really need is a deep-fried snack and a cup of coffee. I’ve always had a weak spot for fries, especially seasoned curly fries. Sparky’s serves these up with a side of ranch dressing, just the way I like them. If you’re craving something more substantial, Sparky’s also has a pancakes and hamburgers on their menu, as well as several varieties of shakes that use Mitchell’s ice cream. Sparky’s is the kind of restaurant that’s at its best in the middle of the night (when it’s the most packed), so if you ever find yourself hungry in San Francisco after a late evening of shenanigans, pay Sparky’s a visit. The memories (and fries) will be worth it.